1 - Nvidia Ion Platform: Atom gets GeForce Graphics 2 - But will we ever see one? Intel's Atom CPU and the subsequent net-product phenomenon in the last year has been the fresh talk of the industry in an otherwise pretty regular world. It's not often we see a whole new product segment created and exploded - we've covered plenty of netbook and mini-ITX products based on this but while they have a fantastic little low power and cost effective CPU, they are ultimately let down by their pairing with an old, hot northbridge and feature minimised southbridge. Intel's Atom now comes in a dual core variety and even though it lacks the all important out of order execution that is an essential component to any modern CPU, it's very inexpensive as a platform and that has made it extremely popular for basic applications. The 945GC northbridge and IGP can be described as, at best, "basic", and the southbridge has only two SATA ports, lacks USB options and the whole thing doesn't even get a PCI-Express x16 slot - or even much in the way of the modern PCI-Express altogether to be honest. At $50 for the entire package of three though it has made extremely cheap platforms for all sorts of official products: netbooks, nettops and mini-ITX boards, but also more exotic home builds like smoothwalls, file servers, powerful routers, NAS boxes, games servers - basically anything SFF you can think of. Nvidia is looking to capitalise on this popularity by offering its own Atom-capable "mGPU" which won't necessarily lower power consumption even though it's a single chipset rather than a pair, but it should offer a whole wealth of extra features and graphics power that'll be like comparing the Star Ship Enterprise to a Canoe. Nvidia has dubbed this new pairing the "Ion" in an attempt to stick with the chemically inclined "Atom" naming from Intel. We suppose "molecule" doesn't have quite the same ring to it, even though "Ion" does leave us chemists thinking of something static or incomplete. 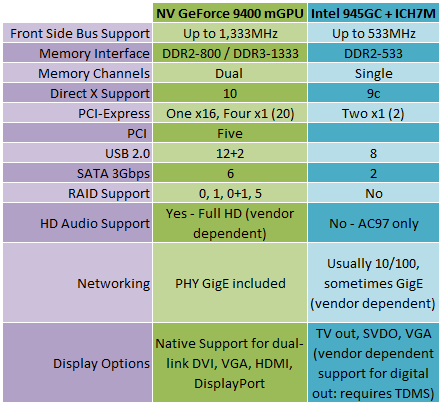 The differences between the chipsets are pretty epic - the Nvidia GeForce 9400 mGPU has plenty of front side bus overhead for overclocking and tons of extra memory bandwidth for the graphics portion that includes more recent DirectX 10 support in addition to four times the shader capacity and several times the clock speed, not to mention the fact that the Nvidia part does hardware vertex shading whereas the Intel GMA 950 does not. While mobile and SFF parts are limited in what they offer, potentially having six SATA on a mini-ITX and PCI-Express x16 is not unheard of and it opens up a bevy of other possibilities into the net-product range, not to mention enthusiasts who want to fashion cheap and innovative home builds like we mentioned above. Nvidia has shown that it can squeeze seven USB 2.0, two eSATA, 7.1 channel surround sound audio, Gigabit Ethernet, VGA, dual-link DVI and HDMI (with HDCP) into the tiny pico-ITX form factor (600mL capacity)!